The M.S. in Speech-Language Pathology prepares students for careers as clinical speech language pathologists. The USF SLP program begins with outstanding applicants and capitalizes on the world-class resources of the CSD Department, including experienced clinicians and scientists from many specialties. Students graduating with a M.S. in Speech-Language Pathology are in high-demand and enjoy rewarding careers in a wide variety of settings. The residential track is a 6 semester program that draws on the rich and diverse clinical opportunities in the Tampa Bay area. SLP students will have opportunities to gain clinical experiences within the University's Speech-Language-Hearing Center, as well as clinical sites outside of the University. Off Campus sites include Veterans affair's hospitals, children's hospitals, private speech and hearing clinics, and rehabilitation clinics. The Suncoast Master's Consortium Track is specifically designed to assist bachelor's level professionals working full time as Speech-Language clinicians in one of the Suncoast Consortium school districts to complete their Master's degree. The Suncoast Consortium track is a 9 semester program that uses a combination of distance and on-site teaching to offer the same curriculum as taught on the Tampa campus. Students who have earned an undergraduate or graduate degree that is not in a Communication Sciences and Disorders department will need to complete a set of pre-requisite courses to be eligible for entry into the Master’s program in Speech-Language Pathology. These courses may be taken at the USF Tampa campus or online. The Masters of Science (MS) education program in Speech-Language Pathology at the University of South Florida is accredited by the Council on Academic Accreditation in Audiology and Speech-Language Pathology of the American Speech-Language-Hearing Association, 2200 Research Boulevard #310, Rockville, Maryland 20850, 800-498-2071 or 301-296-5700. Within the Department of Communication Sciences & Disorders building are the Speech-Language Clinic, the Hearing Clinic, classroom space, offices for faculty, staff, and students, and a student lounge area. The Speech-Language Clinic offers a full array of services in a modern environment with the latest in diagnostic, treatment, and rehabilitative equipment and services. We also engage in a wide variety of related clinical and basic research. M.S. students have several potential sources of funding, including Graduate Assistantships, Fellowships, Scholarships, and Research Assistantships. 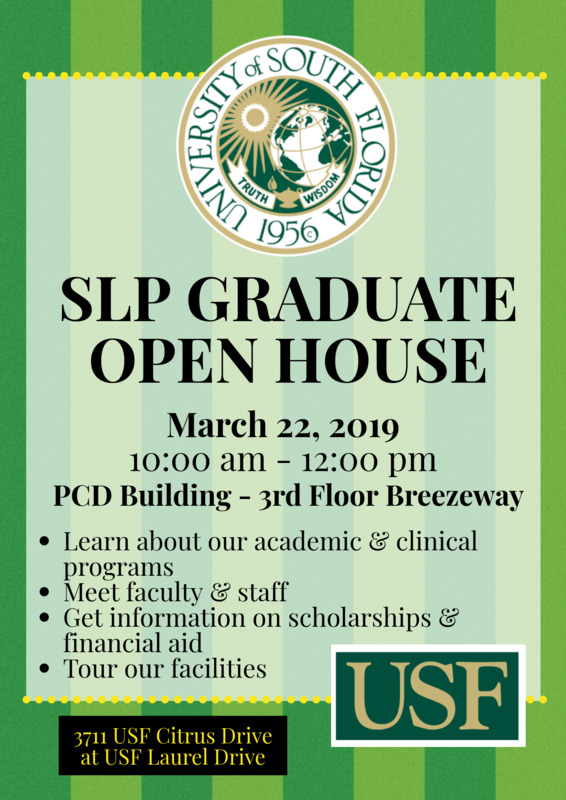 The 2019 Spring SLP Open House will be held on Friday, March 22 from 10:00am - 12:00pm in PCD 3000. For further information about the Master's program, contact the program director, Dr. Carolyn Ford (cford@usf.edu). For further information, please contact Academic Program Specialist, Kathy Wasson (kjwasson@usf.edu) or (813) 974-9840.